Gittel and her mother were supposed to immigrate to America together, but when her mother is stopped by the health inspector, Gittel must make the journey alone. Her mother writes her cousin’s address in New York on a piece of paper. However, when Gittel arrives at Ellis Island, she discovers the ink has run and the address is illegible! How will she find her family? Both a heart-wrenching and heartwarming story, Gittel’s Journey offers a fresh perspective on the immigration journey to Ellis Island. The book includes an author’s note explaining how Gittel’s story is based on the journey to America taken by Lesléa Newman’s grandmother and family friend. Gittel’s Journey tells the story of a brave young Jewish girl immigrating to the United States from Easter Europe, all on her own. And only nine years old! This beautiful, heartwarming story is based on true events the author’s ancestors experienced when arriving on Ellis Island afraid and alone, but risking it all for a chance at a better life. 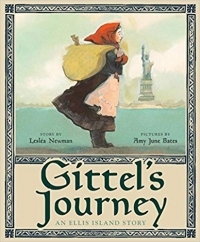 Young readers will enjoy this sweet story and its lovely illustrations—particularly those who are immigrants themselves—while adults will enjoy the true story of Gittel’s Journey included in the final pages from the author. Recommended for all ages, Gittel’s story is sure to inspire bravery and hope for the young immigrants of today, while reminding young Americans that we all have a similar story. ?